We are continually adding new products to our line. Listed below are just a sampling of the recent additions. Click here for a list of New Products for Formula Ford! Mesh Net with Adjustable Mount Straps, SFI 27.1, 18" x 18"
This SFI 27.1-approved square 18x18 mesh window net has two mounting straps on the bottom edge. It is ideal for use in cars with diagonal or X-shaped door bars. Sabelt was one of the first manufacturers to have a driver restraint harness certified to the tough new FIA 8853-2016 standards. We have 7 different Sabelt harnesses in stock for applications from formula cars to endurance racing. The Racing Spirit is all about the love of competition and the drive for excellence. Celebrate your unique motoring lifestyle with this new line of shirts, jackets, and hats from OMP. Styles vary from playfully loud to extremely subtle (we like to call them "spouse approved"). 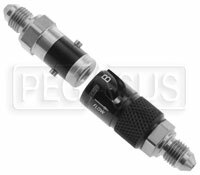 These bayonnet-style quick-disconnect plumbing fittings from Aeroflow are available with aluminum, titanium, or stainless steel bodies (each with a black double-anodized aluminum retention sleeve). Proof tested to 15,000 psi, suitable for any fluid system.